Happy Friday! 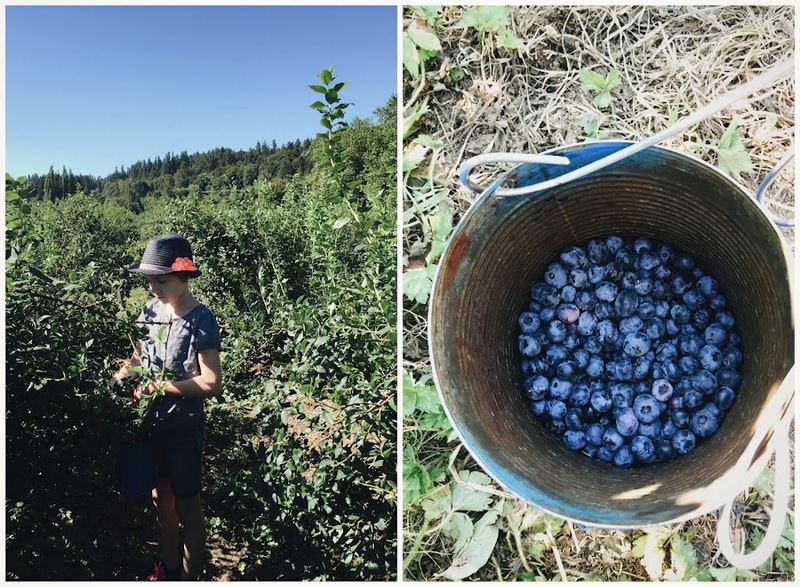 We went blueberry picking with some friends, and picked ourselves about 10 pounds of blueberries. Our friends picked nearly twenty pounds! It was a lovely day and not too insanely hot. I told Julia she couldn't wear a tank top because I didn't want to deal with all that sunscreening, and when her pals showed up in tank tops, guess who was in biiiiiig trouble? (me) Cough. But now we're set with at least two pies worth, a crisp, two batches of muffins at least, blueberry pancake material AND extra for eating plain. We are SET for blueberries. Julia just told me about jelly flower lipsticks. Also, my kid is now telling me about new cool stuff online. WOW. 10 Wallpapers for Children's Bedrooms. 'Gilmore Girls' has a premiere date! Korean skincare products for tweens. Jeska has a ton of garden and floral goodness happening on her blog right now. A darling friend says that 'Moon Over Manifest' is an amazing book for tweens, older elementary. Speaking of cool stuff lists, I love these lists! Cool Book of the Week: 'Fanny in France' by culinary legend Alice Waters is coming this autumn and I can't wait to see it in person! I'm a huge Alice Waters fan, I own several of her cookbooks and I adored her first storybook/cookbook for children, 'Fanny at Chez Panisse', which was based on her daughter's experiences growing up around Alice's famous Chez Panisse restaurant. In this newest book, Fanny goes to France, and learns about French cuisine, and has adventures in Bordeaux, Provence and the Pyrenees mountains. (Sheep! Making cheese! Feeding nine people with one chicken!) The art is the same charming style and I might be thinking hard about this one as a holiday gift next Christmas for Julia, who is loving all things cooking-related these days. Have a lovely weekend! I have a photo session with two toddler girls this weekend, wish me luck! And then Julia is going to make a blueberry pie from our aforementioned blueberry haul. Oh guess what - you know how for years I've been harping on cleaning my garage? Maybe you recall. WE CLEANED IT. It's not totally done, but it's 90%. I'm so delighted! It actually finally happened. I'm now waiting to win the lottery because of all the awesome energy clearing and good feng shui vibes that can now flow through my garage. I told Andrew, that after marrying him and having Julia, this cleaning of the garage has made me almost as happy as those things. Yup! Your blueberry haul sounds amazing! Moon Over Manifest is a wonderful book. The author won the Newbery, and it was only her first novel. Oh, and she lives in my town and I once chatted with her in line at a bookstore reading by a completely different author. We're on season 7 of The Gilmore Girls on Netflix now, and we're so excited for the new episodes. My preteen is obsessed. Have you seen the Stars Hollow Monthly subscription box? I want to get it for her birthday in September. The Alice Waters book looks gorgeous, and someday when I have a different house, I want to do beautiful feature walls in cool wallpapers like those. Have a beautiful weekend!!!! Blueberries. I'm so envious. I wonder if they grow ok around here? I love all the jars in her cozy apartment. I Mason jar crazy. Have been since ever before the craze. They're just so pretty, strong, and multipurpose.